Our line of Swiss surgical tweezers are manufactured from fine Swiss steel. When we listen to our customers, we build a bridge of understanding and rapport. In that understanding, we discover the true needs of the customer. We have had numerous requests from you for affordable and good quality instruments and we are listening. World Precision Instruments is proud to introduce our own line of Swiss-made forceps and scissors. We worked diligently with our manufacturer to make sure our products meet your expectations. With over 45 years experience, World Precision Instruments provides innovative instruments to the biomedical research community. We look forward to continuing to expand our product line to better serve your evolving needs. 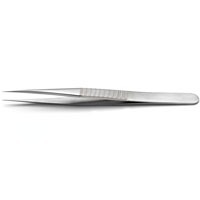 We offer a variety of tweezers and forceps. Let us help you select the correct set of forceps for your application.